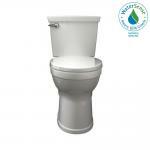 The Champion 4 Max High Efficiency Single Flush Elongated toilet, is the undisputed leader in high performance toilets. With an exceptionally wide 2-3/8 in. trap way and 4 in. flush valve, it virtually eliminates clogged toilets for homeowners and call backs for plumbers. The Champion 4 will move a mass 70% larger than the industry standard. It achieves the highest bulk removal rating of 1000 g and will even flush a bucket of golf balls. Flush with confidence and invest in this superior performing toilet that delivers more when it counts.